The apartment has a beautiful view to the sea.. room is clean and tidy.. apartment has everything needed like a microwave, induction coffee machine etc.. was a comfortable stay.. it’s a 5 mins walk to bus stop. And 15-20 mins walk to old city. The host were very good.. they had come to pick us which made our check in much easier.. and at the end of the trip they also dropped us to bus stop.. Location is good. It's near enough to old town but not too close that you still have some peace and quiet time. Staffs are very helpful and they let us check-in slightly earlier when we arrived. The location of the property was very good. Close to Dubrovnik old town and also a hidden beach with an amazing view. Very nice modernisation of a old characterful property. Excellent tranquil location, some distance out of the crowded town centre, but just a nice walk down to the old town (maybe take a taxi back as it's uphill). Very helpful and friendly host. Easy on-street parking for all size cars. Fantastic views of the sea and old town. Nice outdoor area with sun-beds and tables. Excellent bathroom with washing machine. Good wi-fi. Very comfortable apartment. The host organised airport transfers for us and also brought us to a wedding we were attending. There is a lovely terrace to relax with out door shower. About a 15 min walk to the entrance of old town. The apartment was clean and modern and our host arranged taxi transfers to and from airport. He also messaged several times to check that everything was ok. Amazing terrace with fabulous views - we watched the sunset every night of our stay! Lots of little extras like tea, coffee, bottle of water, toiletries and cleaning products which aren’t always provided in self catering accommodation. 10 minute walk to pebble beach and 15 minutes into the old town. We loved our stay and will definitely be back. Lovely apartment, very clean, great views and amazing host. Good location only 15 min walk to old town. From the start we had excellent communication with Mihael, who kindly arranged our airport transfers. His Father picked us up and firstly took us to a supermarket to pick up some essentials and gave us a quick tour around the town, showing us the amazing sites with advice on bus stop locations, taxis, good places to eat, where to book activities during our stay. Our attic apartment was immaculate & had everything we needed during our 4 night stay. The view from the accommodation had breath taking panoramic views, with Lokrum Island directly in front of us. (an island worth visiting for the cliff jumping and some chill out time) The accommodation was a leisurely 20 minutes downhill to the Polce Gate. The closest Sveti Jakov beach is accessible by road but a sneaky short cut is down a steepish woodland path near to the front door. Banje beach is also on the way to the old town. Both are clean with crystal clear waters. Would highly recommend! 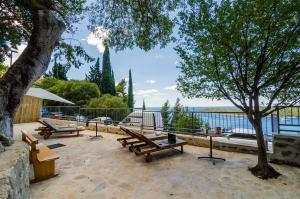 ...away from the tourist crowds with a beautiful view of old town Dubrovnik and the Adriatic. A lovely shared courtyard to enjoy and take in the views. Walking distance to the old town and also a bust stop nearby. Our attic room was comfortable, welcoming with adequate kitchen facilities for cooking simple meals. Our hosts were welcoming and helpful. On checking out - we were allowed to enjoy the courtyard for a couple of hours while waiting for a taxi/airport connection. Our host even gave us cold drinks and chocolate bars while waiting :) Would definitely recommend! The views were stunning from the room. The patio area was nice to sit and relax in. It was a short pleasant walk into town. The kitchenette was well equipped with everything youd need. It was spotless! The shower was great and the bed was comfy. Lock in a great price for Apartments Shining Star – rated 9.3 by recent guests! Apartments Shining Star This rating is a reflection of how the property compares to the industry standard when it comes to price, facilities and services available. It's based on a self-evaluation by the property. Use this rating to help choose your stay! 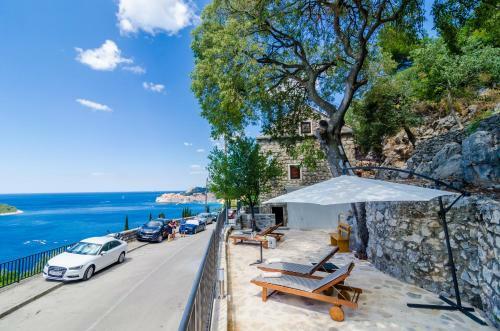 One of our top picks in Dubrovnik.Providing sea views and a terrace, Apartments Shining Star provides accommodations ideally set in Dubrovnik, within a short distance of Ploce Gate, Orlando Column and Banje Beach. Free WiFi is provided. Accommodations are fitted with air conditioning, a fully equipped kitchenette with a dining area, a flat-screen TV and a private bathroom with shower. A microwave, a toaster and fridge are also featured, as well as an electric tea pot. Onofrio's Fountain is 1.3 miles from the apartment, while Pile Gate is 1.3 miles away. Dubrovnik Airport is 13 miles from the property. 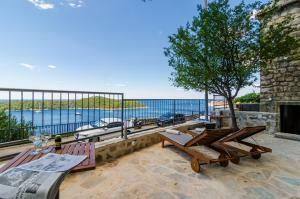 뀐 Located in the top-rated area in Dubrovnik, this property has an excellent location score of 8.7! When would you like to stay at Apartments Shining Star? This apartment has a flat-screen TV, electric kettle and toaster. This apartment features a sofa, toaster and electric kettle. 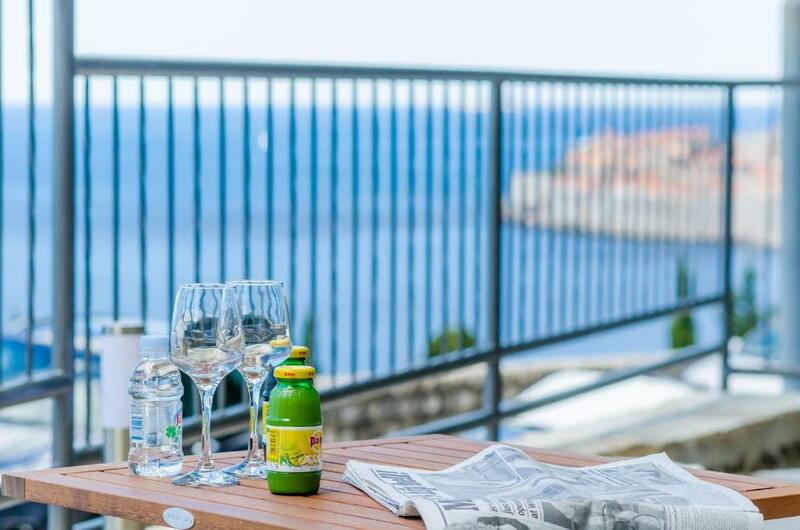 Shining Star Apartments are ideally situated as they are just outside The City Walls and stone's throw away from everything Dubrovnik has to offer, whether one is interested in historic Old City and its many sights or basking in the Mediterranean sun and swimming in the crystal clear Adriatic sea. Guests can explore sights such as the City Walls, Stradun, Rector's Palace and many more that this UNESCO heritage site offers or relax at one of the many cafes and restaurants. Popular Saint Jacob's beach is a short walk away. Nature reserve Lokrum Island is another must see with beautiful botanical gardens, untouched beaches and historic monuments. Grocery stores, restaurants, bars and cafes can be found in the area, as well as bakeries and ATM's. Dubrovnik Main Bus Station and Ferry Port are 5 km away, while Dubrovnik Airport is 18 km away. House Rules Apartments Shining Star takes special requests – add in the next step! Apartments Shining Star accepts these cards and reserves the right to temporarily hold an amount prior to arrival. Please inform Apartments Shining Star of your expected arrival time in advance. You can use the Special Requests box when booking, or contact the property directly using the contact details in your confirmation. No convienient store in the immediate surrounding area. But not too far from the old town. The apartment is excellently located (15 minutes walk to Ploce Gate or 4 minutes drive with Uber - drive which costs around 4-5 euros). The proximity to Ploce Gate is amazing as the old port is at this gate, port where the boats to the islands leave from. We had an amazing view from the apartment of both the sea and Ragusa. The apartment was super super clean (the cleanest we’ve seen from all the houses and hotels we’ve stayed at so far) and it has all the amenities we needed. The hosts were amazing, driving us to the grocery store upon arrival, arranging cheaper drive to the airport for us and promptly answering all our questions. The beach near the property ( St Jacobs beach) is great as it is not crowded at all and the water level (at the shore) is great also for kids or people who cannot swim. It has sun beds and umbrellas, a bar and a restaurant and the prices are decent. The beach is accesable either by road (longer) or goat trail which is a shortcut, but it can be steep on some sections so not recommended for people with mobility issues. 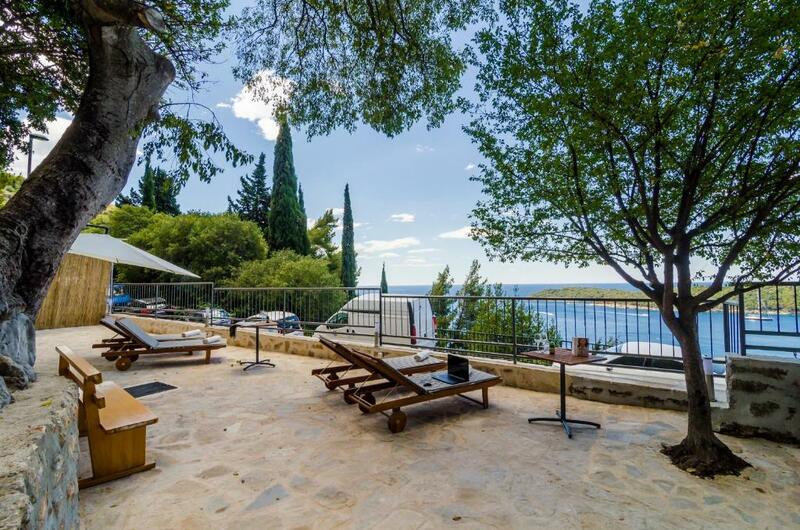 We highly recommend visiting Lokrum island, which is the island you can see from the house. It has amazing views, lots of friendly animals running free (bunnies and peacocks which we fed from our hands some dried fruits and bread), an old mansion and manicured gardens of Emperor Maximilian of Austria, an amazing Botanical Garden and breathtaking view from the top of the Royal Fort. The island also has friendly people and cheaper prices than Dubrovnik. The wasps on the patio - which is absolutely nothing anyone can do at all I understand this!! Big and clean bathroom with comfortably studio setting. Great sea view however is further away from the old town. Owner is really helpful and offers trouble free transport to the airport. Hosts where super helpful and apartment was immaculate. There is a very nice beach close by, but the way to get there is a very steep path. Well-kept and nicely refurbished apartment within walking distance (20min) from the Old Town. Nice patio with sun beds and an amazing view. Easy parking. Very helpful host. The property was so clean and nice, it had everything you need and a lovely terrace overlooking the ocean. Also just a short walk to a lovely beach. Very much enjoyed our stay. Newly renovated, clean, lovely linen and towels. All inclusions one could ask for and more. Wonderful caring hosts. Easy walk to old town and bus 5 minutes walk.